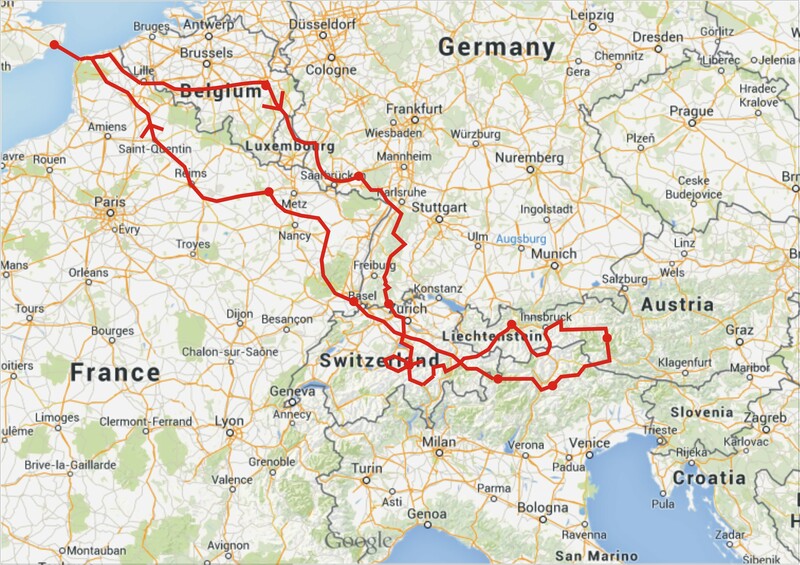 Thinking about making an epic road trip? Then get up and go! I guarantee you’ll wonder why you didn’t do it sooner. The world is filled by some seriously spectacular roads and stunning, and for me in the UK these views are waiting just a short hop away across the English Channel. Plunge deep into the Alps and you will soon lose count of how many times you mutter ‘wow’ to yourself as mountain passes, aggressive climbs and plunging descents unfurl before you around every turn. I’ve seen the rugged Alpine peaks countless times as a snowboarder, but I have to say I’ve been naïve to the wonders of mountains in summer time. Picture rugged untouched terrain as far as the eye can see. Snow peaked mountains, cyan lakes, raging waterfalls and rolling highlands. It’s an addictive riding heaven of roads intertwined with steep drop offs, powerful rivers, epic skyscapes and endless switchbacks. Boarding the Channel Tunnel at Folkestone and throttling across France, Belgium and Germany is hardly a dull schlep, either. The tour route takes you down the stunning B500, and delivers you through endless ribbons of tarmac wrapped in stunning scenery. It’s the ultimate aperitif to a tarmac glutton’s main course. But when you’re undertaking a 2700-mile-plus road trip like this it’s easy to get stressed out. Have I picked the best route? Are the roads going to be as good as I hoped? Will the hotels be alright? Can I handle the distances between stops? What if I miss the best passes? But for me, as I packed my last few bits into my panniers to start the adventure of a lifetime, there wasn’t a worry or question in my mind. I had officially offloaded all for that by booking a guided tour with Tour1 – allowing us to simply concentrate on the ride of our life instead. 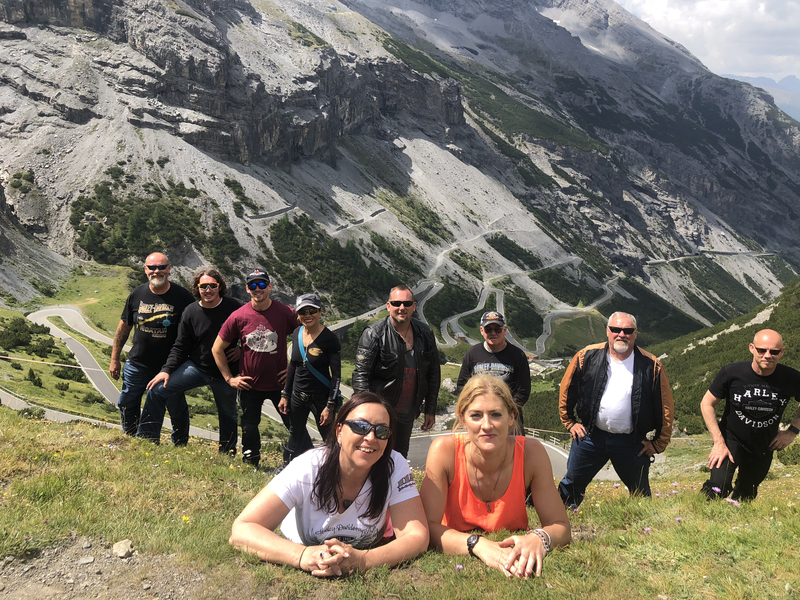 The tour guys recce everything for you, research all the best routes, test the hotels and pick the ultimate roads, restaurants and coffee stops to make your 13-day ride as perfect as possible. They’ve done the routes so many times that they take the stress out of contingency management, too. 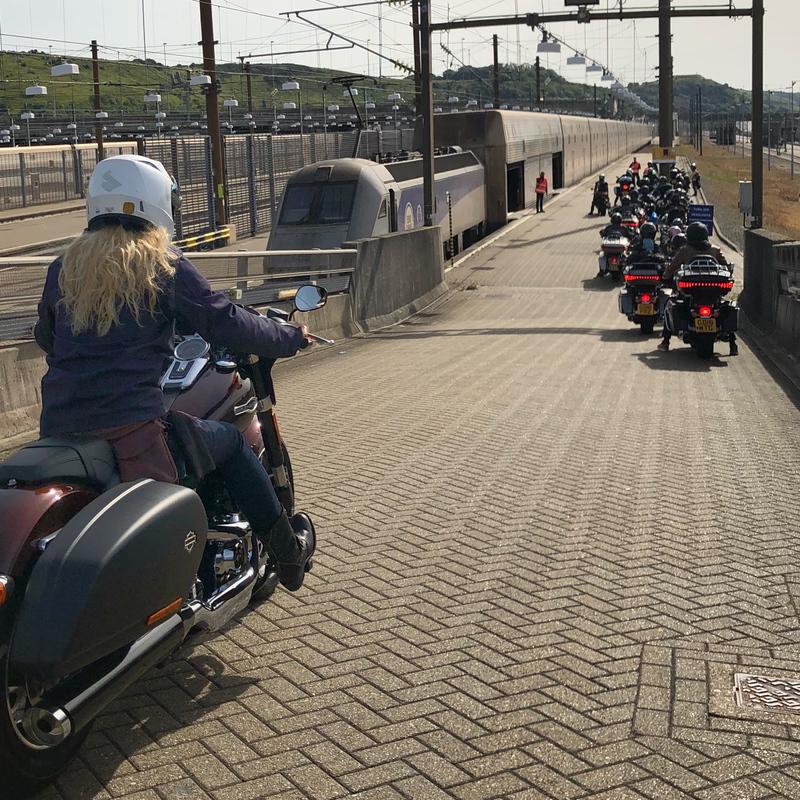 Say your Euro Tunnel is delayed by four hours (yup, that happened), they know how to get you back on time with the group. Or what if a landslide closes a mountain pass (yes, this happened too)? You can simply put your feet up with a coffee while they’re planning an equally impressive alternative route. The only variable no-one can plan for is the weather, but in the Alps that can change between passes, let alone days – meaning that the ever-changing landscape comes with equally changeable micro-climates. In the UK you can get onto a beautiful road littered with sweeping turns and breath-taking scenery, but before you’ve really settled into the flow, the road runs out. Go to the Alps and you can have this all day, every day. If you pick the right tour route you’re going to be immersed in some technical and challenging riding, too. Take the Stelvio Pass, the third highest pass in the Alps. At 9045 feet, it offers 75 hair-raising hairpins and views that will make your stomach lurch. Or the Passo di Gavia – listed as one of the world’s most dangerous roads. It’s a single-track assent with oncoming cars, bikes and bicycles, potholes galore, gravel, rock slides and unpredictable weather. For some it’s the ultimate challenge, while for others it was a risk too far – but no-one is forcing you to tackle the climb. Then there’s the historic St Gotthard Pass in Switzerland. While it’s not a fast road it is both challenging and breath-taking with its cobblestone hairpin bends. Initially, I was wobbling around like a new-born Bambi, uneasy on the uneven surface, but after stringing just a few switchbacks together I started to realise how much grip was available, and it turned into one of the highlights of the tour. But there are many more passes that are just as good without having achieved such fame or notoriety, and even the roads that connect the passes are often gorgeous valley sweepers that ebb and flow through towns and lush lowlands, providing a welcome breather before the next dramatic ascent. I genuinely had sore abs on some of the days from leaning my 320kg Sport Glide over around corner after corner on so many passes. There’s confidence and safety in numbers, too. 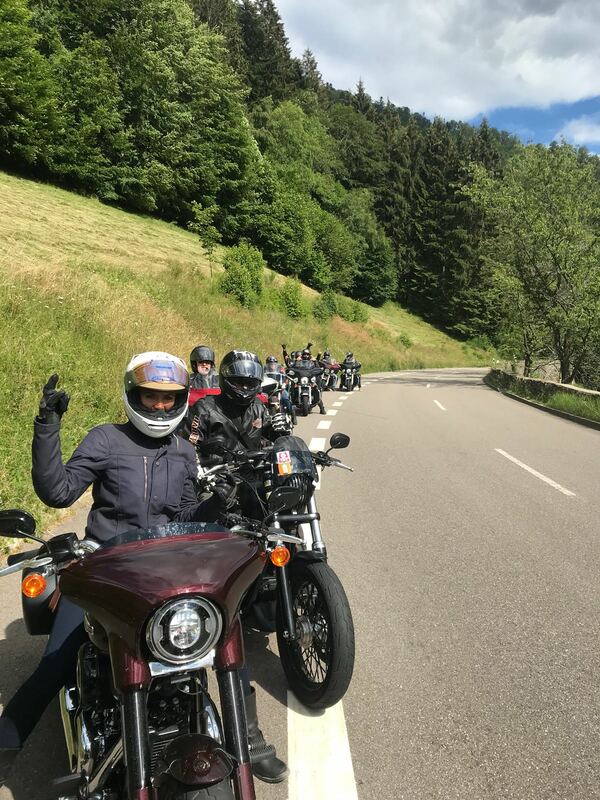 Our gang of 15 thudding Harley-Davidson’s was pretty difficult for drivers to ignore, and the range of experience and skills in the group meant we always had a solution for every eventuality. You then have the skills you can learn from such a group too. At a minimum the tour leader is going to be an advanced rider capable of teaching you a few tricks, but at best there will be some agile, smooth and damn awesome riders to rub shoulders with. For me, a Kiwi guy became by favourite back wheel to follow. Learning off his lines, taking guidance from his speed. It was an incredible way to develop my riding. Had I done the same route without the experienced lead I can guarantee I wouldn’t have developed to such a level. 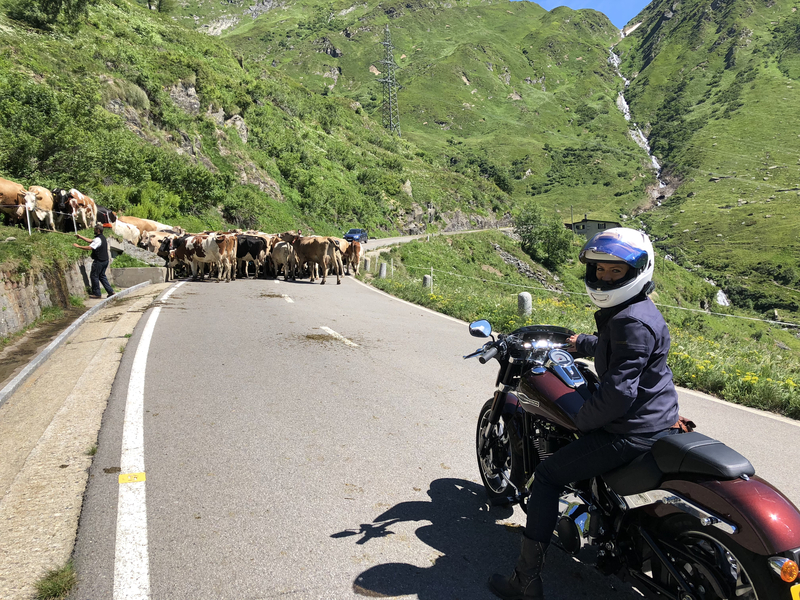 But if you’ve ever ridden in a big group you’ll maybe wonder how on earth you keep 15 bikes together when riding unknown terrain with the lead man on nav duties! Introducing the buddy system. It kept us linked together while also allowing us to ride to our own abilities, the fast riders at the front. Ultimately, each rider was responsible for making sure their ‘buddy’ – the rider behind – knew where to go at any turn off. Ride the straights, stop to wait at junctions. Easy. Doing this mileage in a group really was something special. The looks on locals’ faces as the thunder of engines rolled through, we even had a nursing home out on the pavement when we stopped nearby. Judging by the smiles on their faces they’ll have chattered about us bikers for weeks. 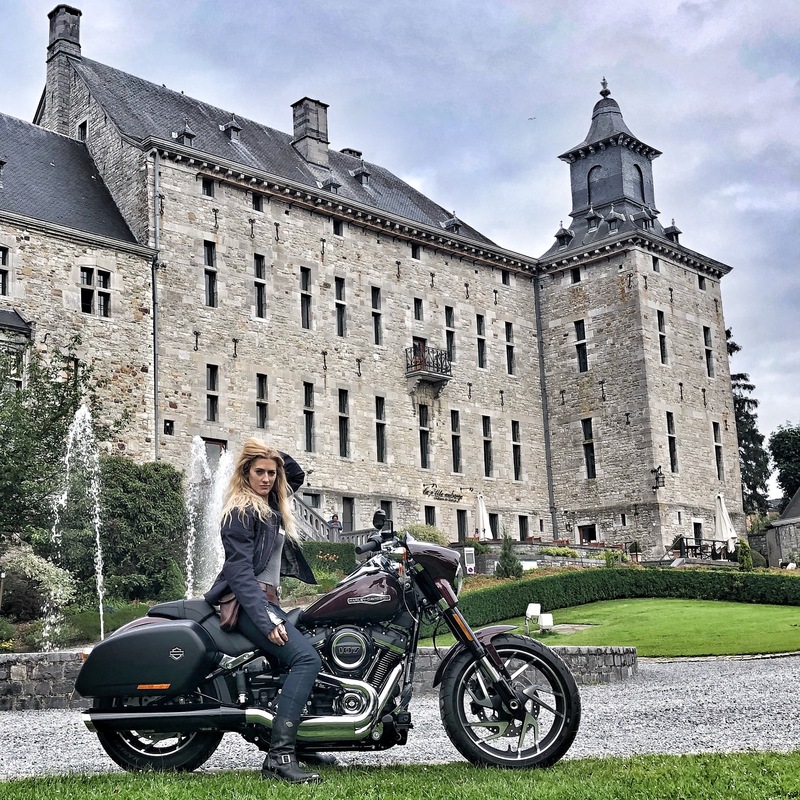 It was lovely riding between so many countries was the subtle transformation of cultures. While boarder-less in the EU, you could quickly tell you had changed country. 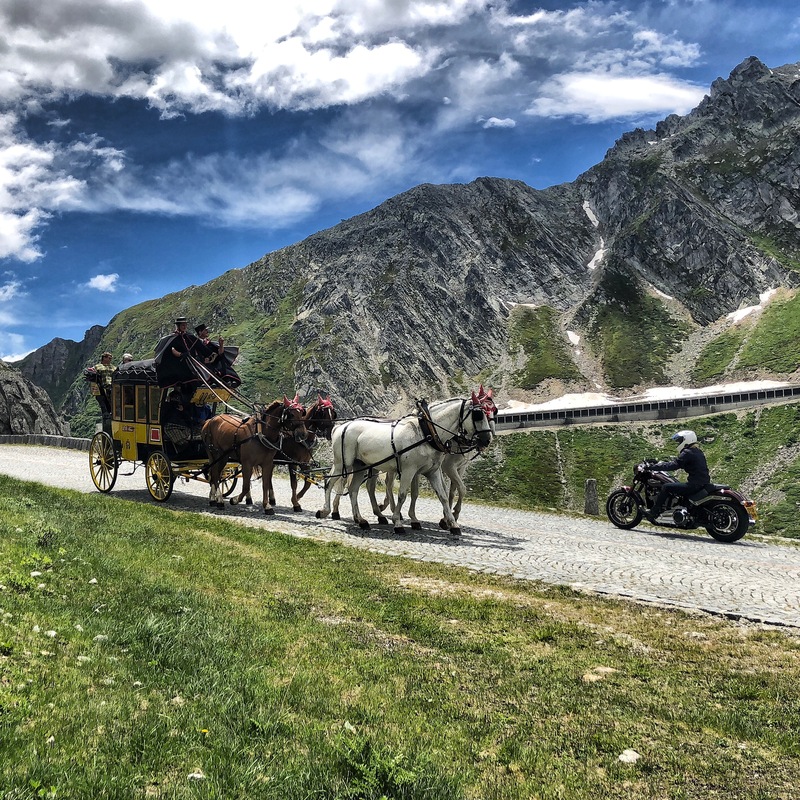 The tour threads its way through nine in total, and the transformation of cultures as you cross each border adds a subtly different flavour to each leg of the trip. 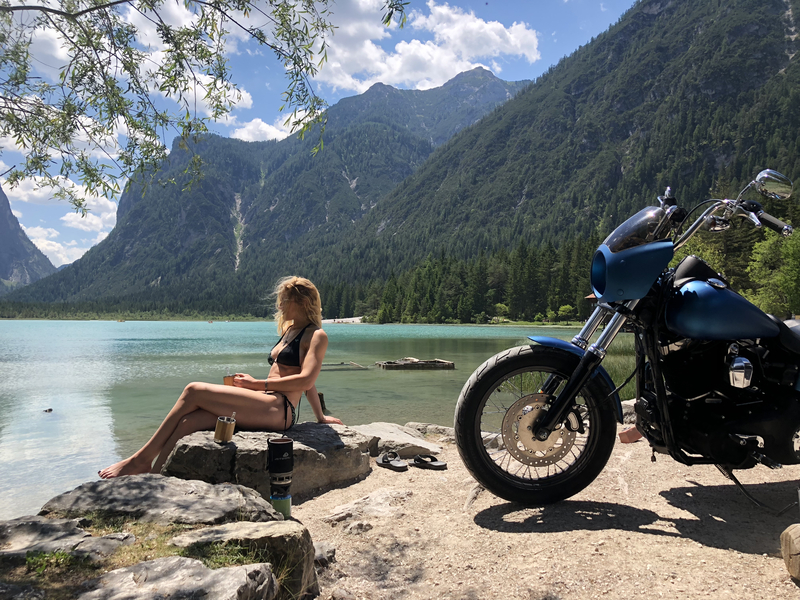 From gorgeous Swiss mountain lodges, to chiming cow bells and lederhosen in Austria, and seemingly infinite local beers to enjoy after a day’s riding – travelling on a motorcycle gets you closer to every country you ride through. But something I never anticipated about riding the Alps was racing bodies in Lycra. Yup, that’s Lycra not leathers. The Alps attracts a huge volume of cyclists and with their light weight ballsy set up they can absolutely hoon it down the mountains. They have crazy grip, enabling mind blowing cornering speed. I genuinely found myself behind a clearly very experienced man in skin hugging lycra and I ended up sat following him for a good mile. Partly because the short straights between the tight corners with oncoming traffic was just a little tight to squeeze past and his corners were rapid with his nimble agility. But if I’m honest, I was probably enjoying his firm calves and bottom too. Nuts to think I had a 1745cc engine and he had his legs. Don’t’ worry, I smashed him on the up! And boy some of the ups were huge! 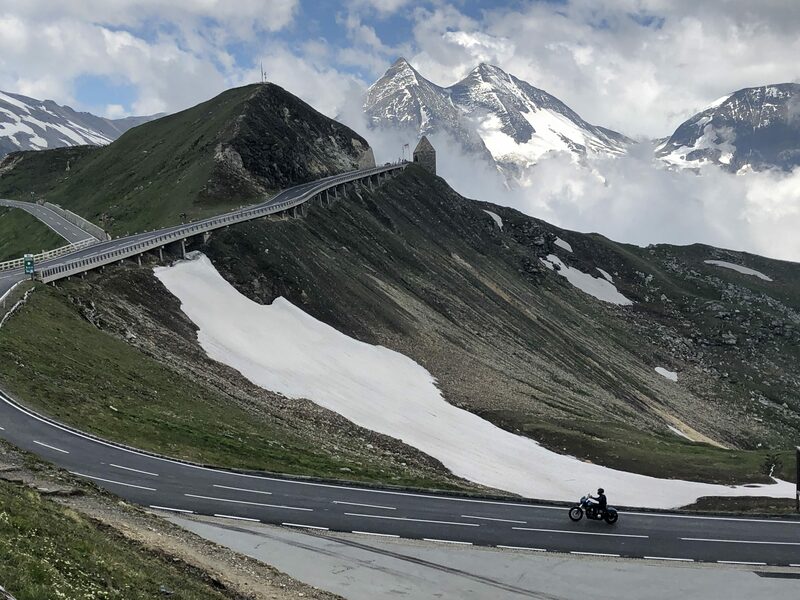 If you want guaranteed pothole free riding, where you can power around any corner with confidence in the rubber to road traction, then Austria and Switzerland are the places for you. 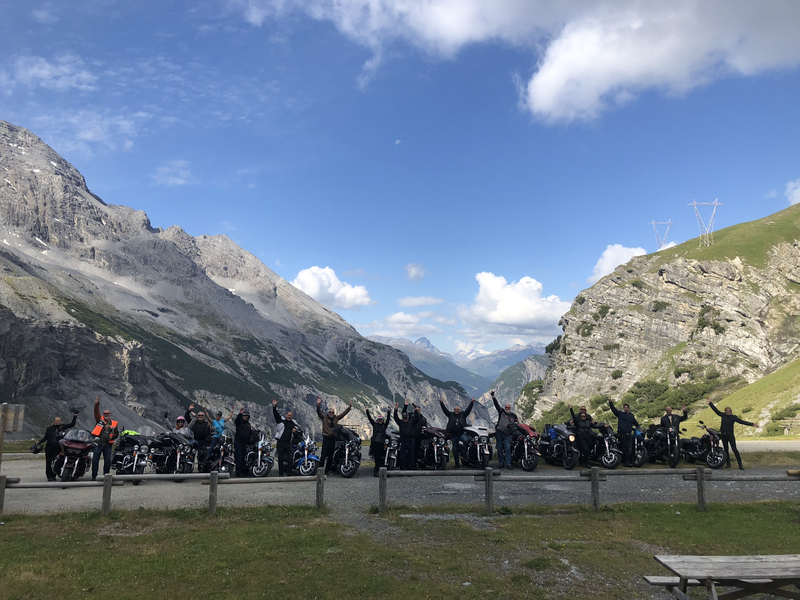 As a relatively new biker, only really taking up two-wheels after my road traffic accident in early 2014, the Alps offered a huge learning curve for my riding. I can’t even think of a hair pin bend in proximity to home, let alone turn after turn. 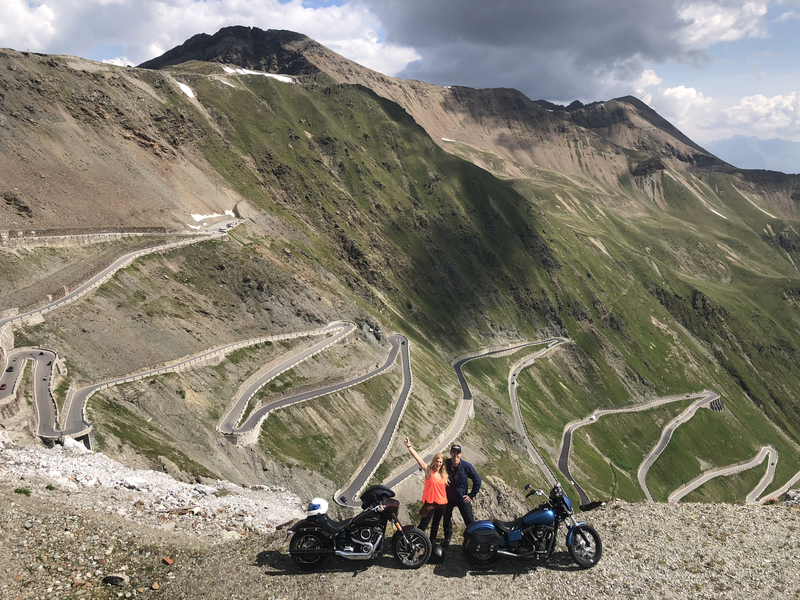 But diving straight into the deep end with a mountain tour, it didn’t take long to get the feel of the riding, pegs down grinning from ear to ear. And now, having completed a 2,700 mile trip around the Alps I feel more confident and more secure in my every day riding than ever before.